Our visit to the Black Hills of South Dakota was an excellent one – with the exception of forgetting to pack our daughter’s bathing suit in anticipation of a stop at Sylvan Lake. That did not go over well at all. (Note to self: Always pack the beach bag on a day out even if you’re not sure you’ll come upon any swimming holes.) We pulled out of the Mystery Mountain Resort in Rapid City, South Dakota, the following morning and continued west into Wyoming. That evening’s destination was Itch-Kep-Pe Park, a small city campground in Columbus, Montana, that would provide us with safe harbor for a quick overnight stop. But first . . . Devil’s Tower! One of the things I love about our National Parks is that all of them are different in some way, shape or form. Even if two Parks are all about mountains, lakes and hiking trails, the mountains, lakes and trails will be completely different and the two Parks will provide visitors with unique experiences. Each and every Park has its own character and personality. Some are historically significant, some have jaw-dropping scenery, some provide a safe home for a wide assortment of wildlife but, no matter what features are to be found in a Park, you can expect your visit to be extraordinary and memorable – and our National Parks haven’t disappointed us yet! Devil’s Tower loomed before us as we made our way toward the entrance of this easily recognized National Monument. Although we were able to enter the Park with our travel trailer, we needed to disconnect it and leave it in a large parking area just inside the gate before we could continue on to the regular parking lot. According the National Park Service web site, “Geologists agree that Devils Tower is an igneous intrusion; this means it formed underground from molten rock. Magma pushed up into the surrounding sedimentary rock. There it cooled and hardened. 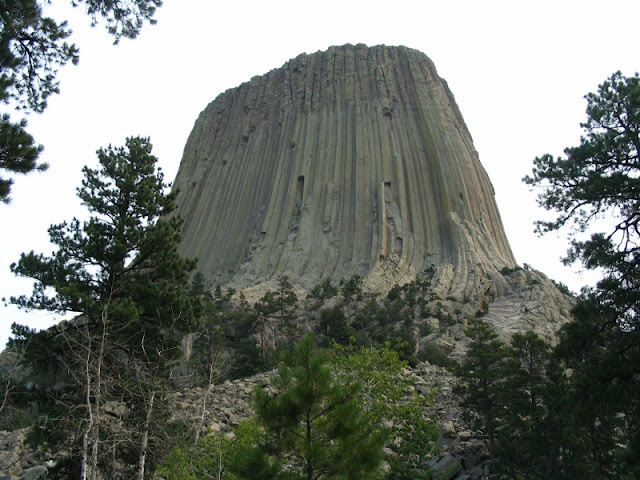 The sedimentary rock has since eroded away to show the Tower.” Devil’s Tower stands 1,267’ above the Belle Fourche River and is 867’ from its base to the summit. The circumference around the base is approximate 1 mile and the Tower trail, which circles the base, is just a tiny bit longer. The Tower is i-m-p-r-e-s-s-i-v-e from a distance but even more so when you’re standing at its base! Devil’s Tower is also of significance to more than 20 Native American Tribes including the Arapaho, Cheyenne, Crow, Lakota and Shoshone. Since it is a sacred site for many Native Americans, both regular visitors and rock climbers are asked to be respectful of the Monument and the area surrounding it. 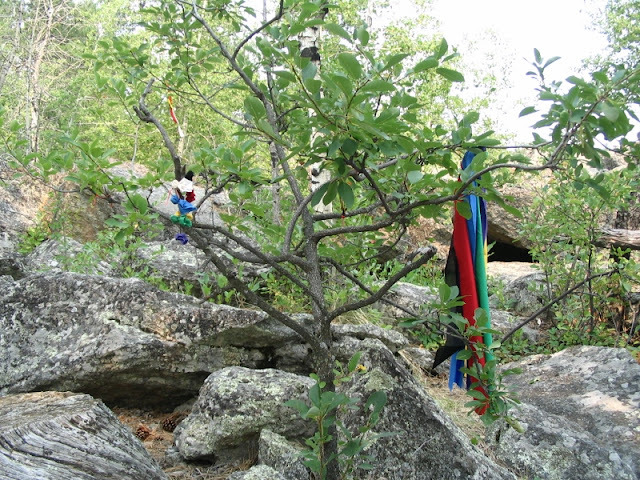 Native American ceremonies still take place at Devil’s Tower and prayer cloths and prayer bundles can often be seen near the Tower and along the trails. These items represent a request, an offering or a remembrance of a person or place and the National Park Service advises visitors not to touch, disturb or remove them. Climbing anything higher than the third step of a ladder is a terrifying adventure for me, but I can see why climbers flock to the Tower. It’s impressive, it’s mysterious, it’s challenging and it’s unique. But I’m quite content to simply say that I visited Devil’s Tower and walked the Tower Trail around its base. 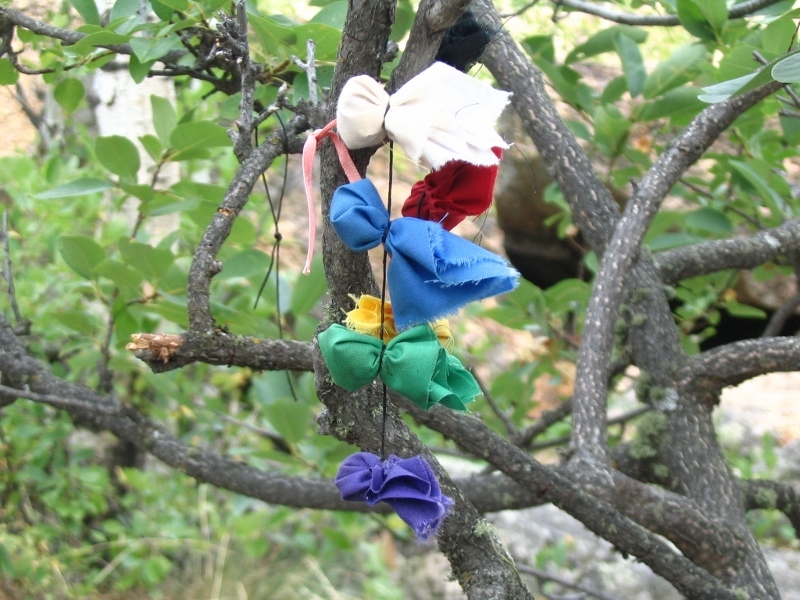 I was touched by the prayer bundles and awed by the climbers we saw. And I appreciate the National Park Service’s efforts to manage this unusual attraction that means different things to different people. The fact that the NPS recognizes and respects the perspectives of all – the Native Americans, the climbers, the tourists – reflects its dedication to protecting public lands for the people who truly own them and I applaud the agency’s efforts to make the Parks and Monuments accessible to everyone and for varied purposes. If you’d like additional information about Devil’s Tower, (link HERE) to its page on the NPS web site. And thank you for stopping by to visit! Please do come back soon - next up, our family moves on to Flathead Lake and Glacier National Park! 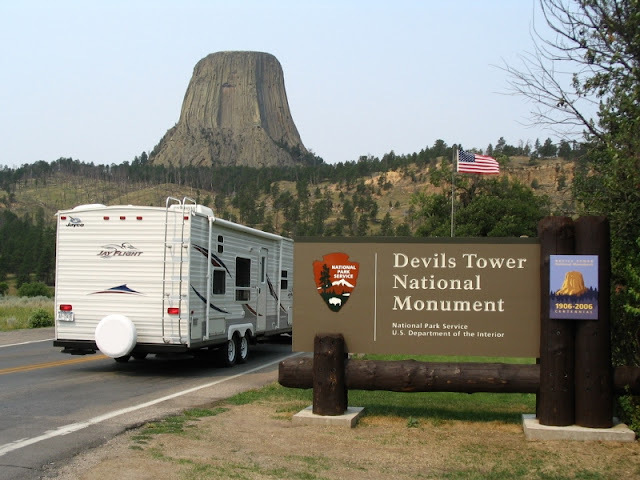 We stayed at the RV park right at the entrance to Devil's Tower. Waking up and going to sleep with that beauty almost close enough to touch is quite an experience. That park shows "Close Encounters of a Third Kind" every single night, on a screen set up so the tower is right behind it. Clever marketing. There is no way to describe the size of the Tower; you have to be at its base to grasp how massive it is. Clever marketing, indeed! As the saying goes, "There's no such thing as bad publicity." :) Thank you for your comments - it's delightful to hear about the experiences of other travelers! I'm not sure why, but this has never been on my bucket list. Luckily, your review provides an exposure that seems just right; I think that will be sufficient for me. Thank you for not posting a hundred photos; the ones you did were just perfect. I am certainly glad we visited, but it's not a destination I feel the need to return to - unlike Glacier or Bryce or Zion or Acadia or . . . Well, actually, I think it might be quicker if I just listed the places I wouldn't go back to! Glad the photos did the trick, Mike!